The Tagus River sits side-by-side with the ancient city of Lisbon, offering unrivalled views over the historic riverfront—but the only way to fully appreciate the scenery is from the water. 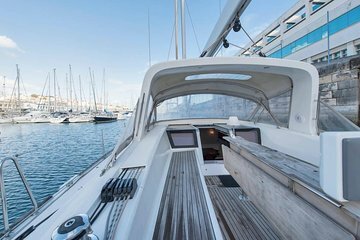 On this tour, choose a midday or sunset cruise and take to the waves aboard a comfortable and luxurious yacht. Sail through the waters off the Lisbon shoreline and enjoy panoramic views of top attractions including the Belém Tower, the Christ the King statue, the Portuguese Navigators Memorial, and the Terreiro do Paço.